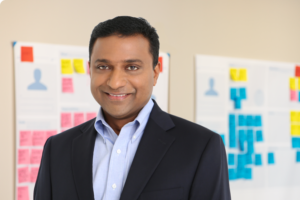 With 25+ years in technology, Suresh leads a global development, security, and compliance team of 100 employees who build and maintain a safe and secure platform trusted by millions. Suresh Babu is the Chief Information Officer of Confirmation and has vast experience in global application development, IT infrastructure, and security. Prior to Confirmation, Suresh was VP of Information Technology for Systemax, a fortune 600 company, where he managed the global IT organization which included operations in the United States, Europe, and India. At Systemax, he built a global product development team for all divisions of the company, designed the network and system security, and implemented information security for the company. Prior to Systemax, Suresh was Director of Software Development Information Technology for RedPrairie Inc. In his role, Suresh managed the architecture and development of the ERP system and a web-based UI application. He designed and developed a new payment gateway, and architected the integration of the ERP system with the POS application. He was also in charge of the conversion of the application to a .NET framework and the PA-DSS certification of the product. Suresh has a MS in Computer Science and Engineering, and a BS in Computer Engineering. He has also published papers on the implementation of a multi-layer neural network solution and solving Gabor Transforms.